I’m at almost the mid-point of my Business Law class, and got to spend my WHOLE weekend figuring out how to write not only a legal brief, but also a response to the case in question. I feel like it broke my brain, and I once again spent a lot of time ranting about how much I hate this kind of logic. 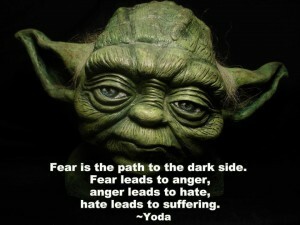 So I’m reminding myself of a Yoda-ism: “Fear is the path to the dark side.” I’m not a huge fan of the second trilogy Lucas put out, but hearing Yoda expand on his warning to Luke from Episode V in Episode I was a singular highlight for me. It did, however, point out to me that this class will take up all my extra energy for the foreseeable future. So my real suffering came from the realization that I will not be able to add to my fiction word counts this month. I’ll fall short of the personal goal I’d set, which makes it unlikely I’ll keep up with the ambitious publishing calendar I’d established for this year. Luckily, that means my only miss for 2013’s Round 1 of ROW80 is the novella that is now lying fallow at about 1/3rd complete. I don’t know if it’s part of my internal backlash against missing out on fiction writing for another week, but I finally bit the bullet and signed up for the A-Z blog challenge again this year. I’ve already plotted a plan for posts through the letter Q, so I’m hopeful that I’ll meet the challenge this year again. In fact, I’m mirroring last year’s efforts in developing a set of quasi-marketing posts promoting different aspects of book 2 in the Red Slaves series. I’m justifying it as complimenting the virtual book tour going on through 4/12, since there does seem to be interest in reading more of the background to my stories. So this is my final check-in for this round. I’m mostly satisfied with my progress, though I can see that some of the classes that are part of my MBA program are going to challenge my personal goals more than I would like. Check out what the others in this round have achieved so far. Hi Tonya, I’m stopping by to introduce myself and wish you luck with the A-Z Blog Challenge. I’ll mostly be exploring CHANGE and SENSORY AWARENESS and how to implement these concepts in storytelling. Hope to see you around – Belinda.